Charitable organizations often approach wealthy individuals with their hand out. There�s nothing wrong with that, of course, it is important to raise funds to support their mission. However, potential donors are bound to respond more favorably to an offer to support one of their donor�s favorite causes: their children. We�re talking about providing opportunities for helping parents inspire their children to become philanthropic as well as sharing values and time together . There are many ways your foundation can do this. � Host a parent-child party with fun activities that will get them excited about all the good your organization does. For example, if your group supports research for a childhood disease, perhaps you can provide art supplies and ask the kids and parents to create a get-well card for children in treatment at a nearby children�s hospital. � Provide opportunities for them to help. If your group supports animal shelters, you can sponsor a visit to a local shelter where they can feed the animals and play with kittens or puppies. If your mission is to advance music or the arts, invite young children to a concert or kid-friendly exhibit. � Create parent-child volunteering opportunities. Families that volunteer together �serving or preparing food at the local soup kitchen, visiting the elderly at a local nursing home�send powerful messages about the importance of giving back, share extremely bonding experiences and learn firsthand about people who are less fortunate. � Encourage kids to participate in a fundraising campaign. They can help design posters, for example, to put up around the community announcing the campaign. � Social networking. Teens are the experts in this department, and the possibilities here are only limited to your and their imaginations. Contact kids of adult donors and prospects, inviting them to attend a brainstorming session to create a Facebook fan page for your organization. Encourage them to post news about your activities on their own Facebook and Twitter pages. � Host special kid-friendly events, such as an ice cream social or even a formal dance for children of potential or current donors, where they can also learn about the causes your organization supports, the results of your grant-making, and future goals. � Sponsor activities or vacations that involve volunteering in needy communities, such as building homes with Habitat for Humanity or installing water pumps at school playgrounds in South America or Africa through Play Pump International. Investing sweat equity in organizations to which families donate their financial equity engenders a deeper connection, not only between the family and your foundation, but also among the family members themselves. � Create an internship program, either as volunteers or in paid positions, where they can earn college credit, gain experience and job references. You can develop separate internships for marketing, accounting and finance majors, for example, in departments where they will learn related real-world skills. � Set up a junior board or committee. This is a great way to harness the energy, passion and creativity of 20-somethings. The committee can focus on marketing, fundraising and/or community outreach. 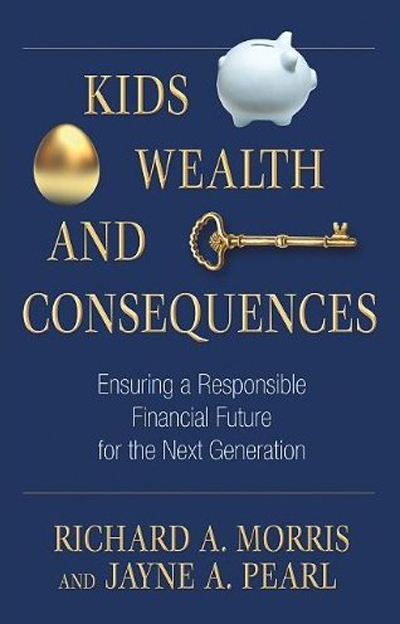 As we explain in our book, Kids, Wealth, and Consequences, the benefits of involving children are many. Not only do you develop a new generation of potential donors who feel emotionally tied to your group and its mission, you also develop deeper connections with their parents. As we all know, as parents, if our children are involved in an activity or cause, we�ll likely want to become involved as well. Sometimes giving a hand to your donors and prospects is more effective than reaching out with an open palm.